Partnerships created to promote a safe and healthy community. The primary mission of the Anne E. Casey Foundation is fostering public policies, human services and community supports that more effectively meet the needs of vulnerable children and families. Jefferson Parish is proud to have been selected as one of seven sites in the United States to receive the foundation’s investment of resources. 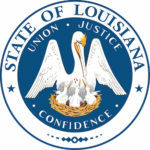 In a collaborative effort with the Jefferson Parish Juvenile Court system, the Jefferson Parish Sheriff’s Office and the Jefferson Parish Public School System, the District Attorney’s Office is working with the foundation to effectively implement evidenced-based juvenile justice reform policies with the goals of decreasing juvenile arrests and increasing public safety. The John D. and Catherine T. MacArthur Foundation supports juvenile justice reform in 35 states, primarily through its Model for Change initiative. This initiative aims to accelerate a national juvenile justice reform movement to improve the lives of young people in trouble with the law, while enhancing public safety and holding young people accountable for their actions. The premise of their work in juvenile justice is that the understanding of scientific research on adolescent development and mental health will help decision makers develop more effective policies and practices and make more rational choices in individual cases. By supporting research, training, practical interventions, policy analysis and public education, this foundation strives for a fair, rational and effective juvenile justice system that recognizes the developmental differences between adolescents and adults. With a commitment to the greater New Orleans region, the Baptist Community Ministries Foundation focuses on attaining a more healthy community. The foundation provides grants in education, government oversight, health and public safety. The Jefferson Parish District Attorney’s Office is the recent proud recipient of the foundation’s support of resources to create and implement the first “Restorative Justice Approach” in a Louisiana Juvenile Court setting. Restorative Justice empowers and repairs communities by giving the victim a voice and allowing the offender an opportunity to repair any harm done. In 2013, the District Attorney’s Office successfully sought funding to create a Pre-Trial Juvenile Diversion Substance Abuse Program. We were again awarded additional funding in 2014. With a dedicated, full-time substance abuse counselor, the District Attorney’s Office has been able to offer substance abuse services, such as substance abuse education, counseling and testing to hundreds of young adolescents involved in the criminal justice system. The purpose of the Jefferson Parish Children and Youth Planning Board is to participate in the formulation and preparation of a comprehensive plan for services and programs for children and youth in Jefferson Parish. Its aim is to assist in the development, implementation and operation of services to encourage positive development for all youth, including the diversion of youth from the juvenile justice and foster care systems, and the reduction of incarceration of youth. The coordination and implementation of services include, but are not limited to, prevention, early intervention, diversion, alternatives to home displacement, alternatives to incarceration and treatment services. In 2012, the Pre-Trial Juvenile Diversion Program received financial support from the John D. and Catherine T. MacArthur Foundation to begin offering the Active Parenting Program. Since then, the District Attorney’s Office has continued to provide the funding to offer the program free of charge to the public. Teen Talk is a four-session group offered throughout the year. These groups are focused on making good decisions regarding issues that many teens face every day. Our Pre-Trial Juvenile Counselors assist teens in acquiring social and decision-making skills. We adhere to the belief that by providing youth with accurate, non-judgmental information they can make healthier decisions and choices for themselves, resulting in positive futures and good citizenship. 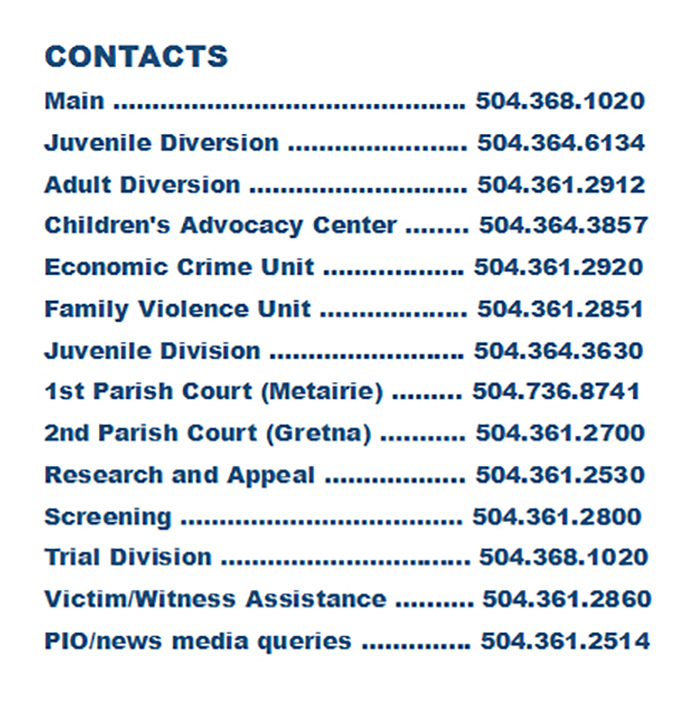 In 2013, the Pre-Trial Juvenile Diversion Program partnered with Stacie LeBlanc, Esq., Executive Director of the Audrey Hepburn Care Center at Children’s Hospital in New Orleans, and the Jefferson Parish Coroner’s Office to offer this educational program to both teens and parents. 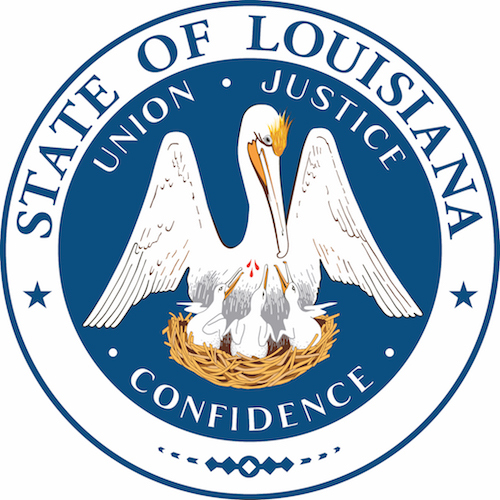 We provide basic legal knowledge to help teens and their parents understand the laws regarding teen sexual activity in Louisiana. While each family will have their own expectations and ideals regarding sexual behavior, it is important for teenagers to know the legal consequences of their actions and responsibilities. H.E.A.R. (Helping Everyone Achieve Respect) is a 50-minute classroom presentation developed in collaboration with Harvard Graduate School of Education and the University of Nebraska-Lincoln. The program is designed so that high school students have an opportunity to reflect on real bullying and cruelty situations and to brainstorm appropriate ways to respond. By providing structured discussion and personal reflection opportunities as part of this presentation, students will be more informed about the causes of bullying and better engaged in brainstorming solutions.